It was only a matter of time before I shared my passion for Freshly Picked on the blog, considering V has been rockin' em since 5 months old and we've been lovin' em ever since. And what better way to kick off a new month than by featuring & reviewing the famous FP? 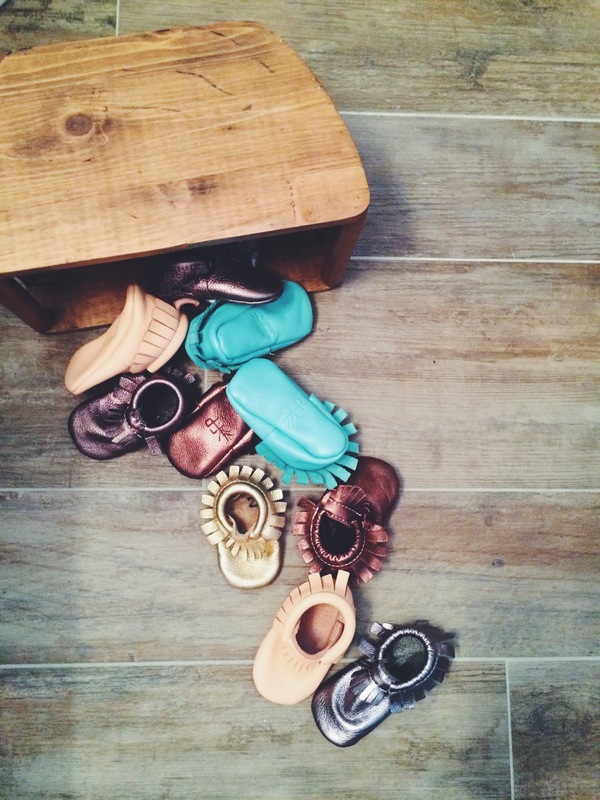 Not only does Freshly Picked make the most beautiful leather moccasins for babies & children, but the story of how Susan - entrepreneur, owner and CEO of FP - started her company is inspirational to so many [read the full story here]. 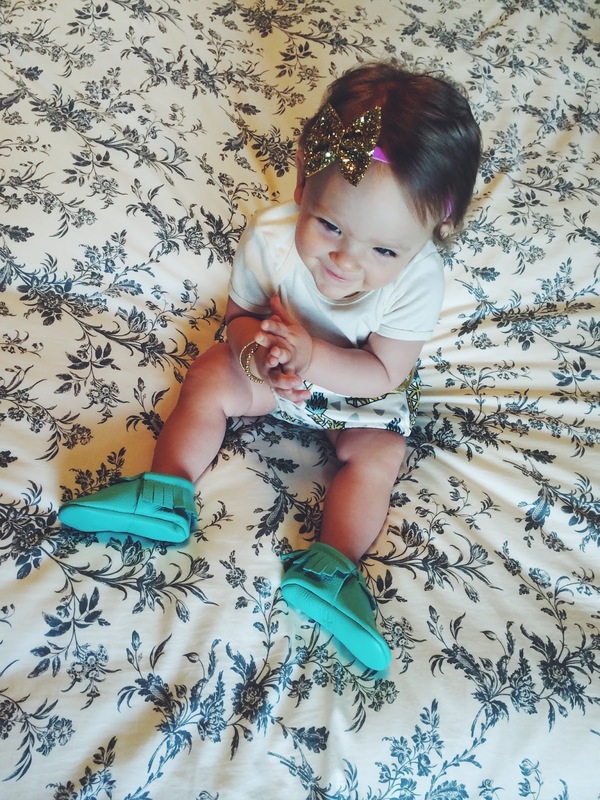 Olivia has been wearing FP moccasins since being just a tiny baby and every pair we've had has impressed us beyond words. In the land of baby shoes, Freshly Picked is top dog. They are 100% genuine leather, made in the USA and offered in a rainbow of the most gorgeous colors. Seriously. Thank goodness for my self-control or I would own them in every single color. Each pair of moccasins is made of the softest leather that is almost like butter in your hands, and undoubtedly comfortable on your babe's feet because of their design and soft sole. Babies are constantly changing and growing, and that includes their little feet. Born with 22 bones in each foot, by age 5 a child has 26 total bones. The first few years are so crucial because the bones are made of soft, flexible cartilage that gradually converts to solid bone over time. By offering a soft sole, a baby's foot has the room and flexibility it needs to grow properly without being restricted. 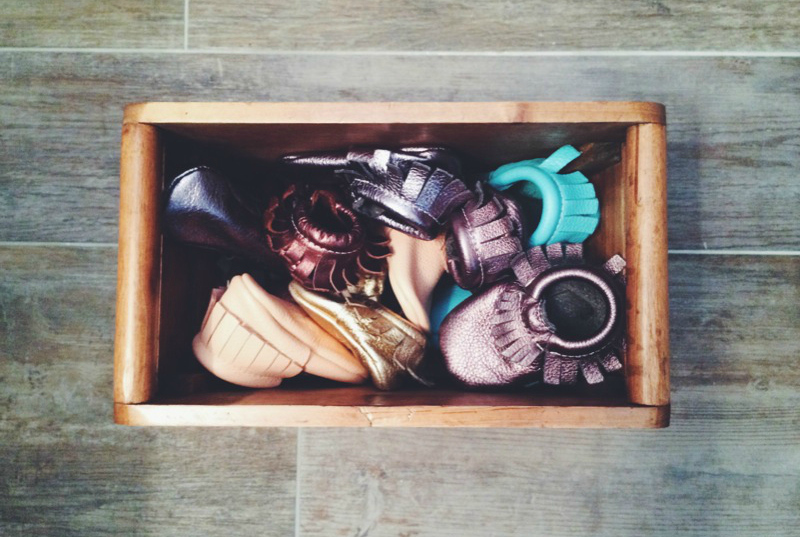 The first pair I purchased were Gold, Size 2, back in October 2013 when Olivia was turning 5 months old. I really came to know about FP last summer and then finally gave in and purchased a pair during the fall for the cooler weather ahead. I love the design of them and how strong the elastic is around the ankle. It stretches to make them easy to slip on but does not wear out or loosen even with excess wear. They don't come with a marked "Right" and "Left" shoe and that is because they are designed to shape around your babe's foot. With consistent wear, they will mold slightly to each side. Even in warmer months, they are better than socks because Olivia can so easily pull her socks off and with these she has a much more difficult time. Now that Olivia is starting to walk, I especially love having FP moccasins on her. When we are out and about and I set her down, I don't have to worry about where she is walking or what her feet are touching because she always has on comfortable, classy shoes that not only stay on but look great. They pair so well with every outfit of Olivia's and add just the right pop of color to any look. We have especially loved the aruba & coral pairs this summer since they are bright and fun. Otherwise, I tend to buy metallic tones because they are neutral for year round wear but still gorgeous. For metallics, we have gold, copper, fool's gold, platinum & steel. Initially I imagined her to wear some colors over others but I've found they all get equally loved. At 13 months, Olivia is currently wearing a Size 3 [which fits perfectly // Copper, Fool's Gold & Steel] and a Size 4 [Platinum, Coral & Aruba] with plenty of room to grow. The easiest way to determine your child's size is to measure their feet in inches. The Freshly Picked website offers a sizing chart that you can download and print, but I've found measuring with a cloth tape measure and comparing to the size chart is the most helpful. At 5 months old, I purchased Size 2 and they had room to grow. Around one year is when she really couldn't wear her Size 2's anymore. They stretch a bit as they are worn but I always size up when purchasing since even when they are a bit loose, they stay on a child's foot. I casually asked Dustin what he thought about FP moccasins because although I know he likes them enough to support my love for them, I had never really gotten his full opinion. "They're easy to get on and off, they stay on once they are on, and the quality of the shoe is unlike anything else. They're perfectly designed and I wouldn't change a thing about them...Cause I really wouldn't," he said. In the many interactions I've had with Freshly Picked & the collaboration staff, I have been nothing short of impressed each time. The friendliness, kindness and generosity is astounding. Honestly, Freshly Picked has me for life. Although the price is a bit higher, I often buy when 25% off sales are offered [usually twice a year, on Black Friday & end of May] and stock up for the seasons ahead. Many moccasins are sold for $30-$40 per pair and while that is a bit lower than FP [whose moccasins are $60 per pair], the quality is almost always unmatched. I would rather pay a bit more for a perfect pair than buy two pairs of lower quality for the same price, because they won't hold up as long or be as durable. And certainly no other moccasin shop offers such an array of colors. Rose Gold is at the top of my wish list, as well as Raspberry & Glacier. I am also swooning over Goldenrod & Butterscotch for Fall. I have always loved Blush but will save that color for my next baby girl as her first pair of shoes [with her second pair being the heirlooms]. In fact, I plan to save each and every pair for all my future babies, and considering we want 6, I'm pretty sure I'll get my money's worth out of them. Although, I feel I have already because Olivia wears hers every single day, even inside the house just playing. Our basement tends to get chilly when we run our AC in the summer and I throw moccs on her to keep her feet warm. Socks aren't even an option because she just pulls them off and chews on them. It's the cutest thing ever though. Olivia loves to play with our shoes so much that I finally decided to move her moccasins to a place she could access easily. I found an old uniquely shaped wooden crate [on clearance at Home Goods, score!] and filled it with all her pairs. It is the perfect size to sit next to her dresser/changing table and when we are getting ready for the day, I set her on the floor and let her pull out the pair she wants to wear. Plus, it adds to the decor of the nursery in the perfect way. I have nothing but wonderful things to say about Freshly Picked, Susan, the entire team, all the Official FP Brand Reps and of course, the moccasins themselves. The first shoes Olivia ever wore were her tiny gold Size 2's. I will be putting FP on V until she outgrows them and lucky for me, then it will be time to put them on her younger brothers and sisters! 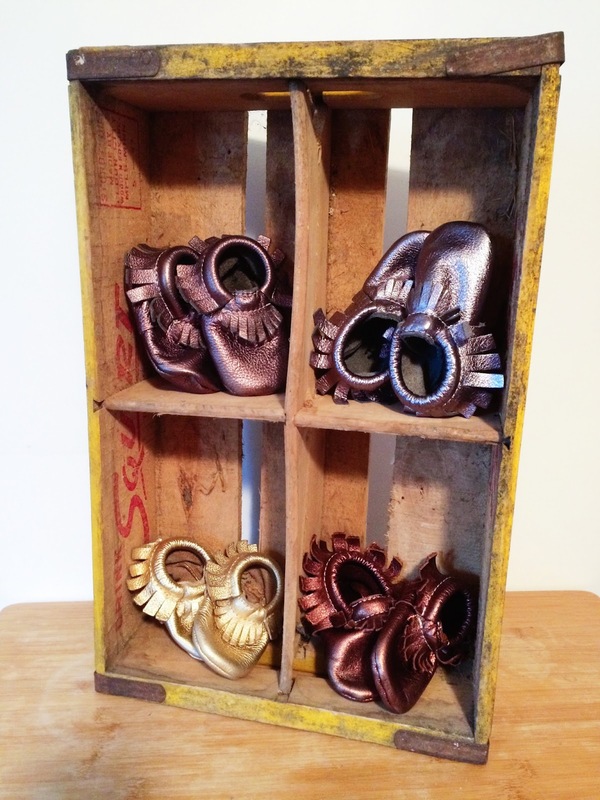 Freshly Picked has so generously offered to give away a pair of moccasins in the winner's choice of size & color. Simply complete the steps below in the Rafflecopter to enter. Please note that the color and size must be in stock once the winner is randomly chosen; the winner may not have won another giveaway including a pair of FP moccasins within the past 60 days. Giveaway begins Tuesday, July 1 and ends Thursday, July 10. The winner will be announced here and contacted via email and will be responsible to respond within 24 hours to claim their prize. I LOVE the gold. I've been swooning over them for Mara's first birthday outfit. I just haven't been able to pull the trigger on the price. My favorite are the rose gold... I'm also swooning over their bags! I'd kill to have one but my husband says, since I'm a bag hoarded, if have to get rid of all of them first. He's got me there, no way can I get rid of 20 bags just for one.. Even if it is freshly picked! Yay! Hoping to win a second pair! I love the Goldenrod because it is our favorite college team's colors! I would love to finally win a pair for R! Rose Gold are my favorite! Entered with name Em Mahr - I like the stone suede color because it's gender neutral. Gold!! Is my favorite because it can just simply go with everything! The rasberry are my fav!! I think it would be such a pretty color for fall!! I love the heirloom too!! I love Aruba! It's my favorite color!! I love FP moccs, and we've received so many compliments when Walter wears his! I would love to get the metallic Steel pair for W! Thanks for the great giveaway! I love the walnut because they are such a versatile color! All of the FP colors are amazing but I love Weathered Brown and Cherry! So hard to choose just one...Aruba or hot pink!! i love the weathered brown & camo, they're the perfect neutrals! I love the butterscotch because they go with everything! I love born in the USA because they would look perfect on my son! I love *Cherry* because they are so vibrant! Freshly picked moccasins are so very timeless, they are something I will treasure for years to come. I saved my sons FP moccs in hopes that one day I could use them for his future brother or sister. Now I am hoping that she will cherish and save them for her future children. It would be so amazing to win a pair of freshly picked, to add a bit of color to our gender neutral collection. Weathered brown for my little sonny! I love the Golden Rod moccs because the color is so vibrant and energetic. I would love for my little bundle to have a pair to call her own! I love chocolate because it would go with everything! Love FP moccs and can't afford them right now for my grandbaby....So winning a pair would be a dream come true. I'd pick Aruba or Hott Pink! Thank you for this opportunity! I love love love the patriotic moccs!! They are so stylish and such a perfect way to let your little babe support the USA. I also like ivory because they would go along with about everything! Like you, I am drawn towards the metallics, but there is just something about that coral...so neutral and beautiful. It's my fav! I LOVE the hot pink! I would love for my little one to have a pair! I LOVE the cherry! There is something about little red baby shoes that gets me every time! I love weathered brown. It's neutral and would be so cute with everything! I LOVE the neon green! What a fun color for the summer and an awesome pop of color in the fall! I really love the purple ones. My daughter looks soo cute in purple. The neon green mocs are for sure my favorite! I love all things neon! It goes with everything and looks ahhhmazzzing in all seasons! Neon green is the new black, not orange! :) Thank you Freshly picked for being so dang hip! And thank you A Blessed Nest & Freshly Picked for this giveaway!! These are so pretty in Butterscotch! It would be a toss up between the swimming with the sharks and the sand ones because they both would be so versitile with a bunch of outfits! I've been wanting a pair of these for my boy once he starts walking, would love to win!! The Sprout is my favorite because it reminds me of leaves on a tree. I love blush. It's perfect for a girl. I love FP! We would love to first pair. We love the Aruba because it can make any summer outfit pop. we also love the rose gold because it's classic and timeless and pairs perfectly with any outfit. I love the gold and the radiant orchid!! I love the blush color because it would go with so many outfit colors. Love the Aruba color! It's bright - and is the perfect pop of color for summer! I like glacier! It's gender neutral so I could save it for my future child! I'm in love with the gold! Would love them for Bella's first birthday outfit! My favorite is glacier. It's such a great color and we have a lot to match it! I love platinum, they can be casual or dressy and would go with everything. I love the platinum since it is gender neutral and could go with anything! I love the sand suede color because they're classic! I love the Aruba! I love adding a pop of color to Savanna's outfits and I think this one would be perfect!